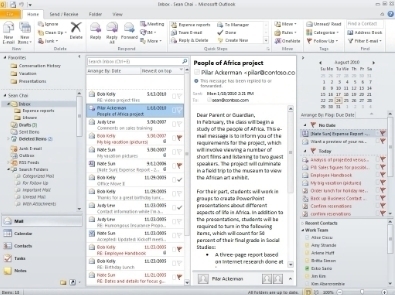 This is a screenshot from an official promotion video of Outlook 2010. Seriously, what a trainwreck. I still remain a Microsoft fan, but this screenshot just shows the lack of any intelligent design direction anywhere in the company. 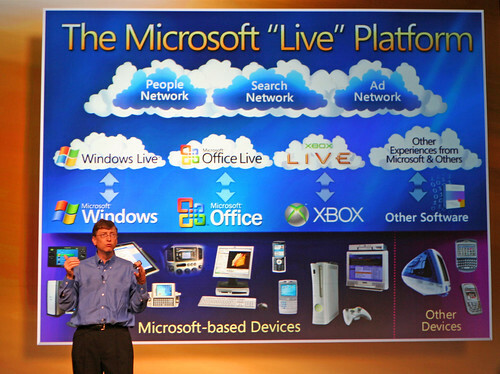 I previously wrote about the design disconnect at Microsoft here. I recently attempted to navigate this on a Clients computer not so long ago - instant migraine material! I think messy interfaces make some people feel as if they're getting more work done. I have no idea how people work like this. I have friends who came from PCs to mac and they complain that mac mail is too simple. When i dig deeper, it seems the app is fine, but the user doen't feel like there is enough stuff at their fingertips. Pretty much totally not true. Whether Outlook is a bear or a great console of useful information at a glance is up to the user to configure. I find it's a fantastically fast and easy way to manage my work email. I'd use it at home if I had an Exchange account. Instead I use GMail, which is good, but not as effective as Outlook for keyboard users. Heck, in GMail you can't even sort mails by Subject or Sender. (Yes, I know you can search by them, but that's a search for each Subject and each Sender. INSANELY inefficient.) Also, GMail is doing substantially the same thing, by adding Calendar and Agenda and Task and Contact previews directly into GMail as well. Yes, this screenshot is cluttert and should never been used to advertise office. But apart from that, outlook 2010 has a great UI. – The new GMail theme on the other hand doenst work for me at all. Having no visual context but a clean UI dies make it look simplerer but makes it impossible to focus and work with. * you are very right in ny opinion. I find it's a fantastically fast and easy way to manage my work email. I'd use it at home if I had an Exchange account. Instead I use GMail, which is good, but not as effective as Outlook for keyboard users. I use both Google and Outlook, and what concerns real efficiency with a lot of data to be handled and combined, Outlook is lightyears ahead. That MS does a bad job using a screenshot with such an ugly and 'anarchistic' GUI example is quite a different issue. I work from home selling export goods and I think MS is doing just what a company does, that is trying to make money. We still have a lot of other options, but right now MS is it. Yea, there are not enough buttons!